Xara Photo & Graphic Designer 6 ($90, seven-day trial) is a graphic design alternative to Photoshop that specializes in doing one thing really well: desktop publishing. Simply by clicking the Designs Gallery icon, you gain access to dozens of templates for things like newsletters, Web sites, photo albums, CD covers, and so on. Anyone with a small business will drool over the stuff that Xara Photo & Graphic Designer includes. 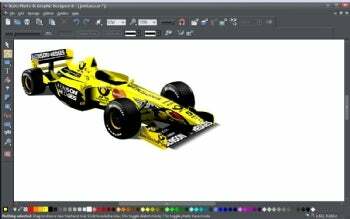 This modifiable 3D racecar is among the free offerings available in Xara Photo & Graphic Designer. After importing a template or design, it's really intuitive to move things around, change the text, change the color, and so on. Xara Photo & Graphic Designer's icons are bright and clear, and all have tooltips; color swatches reside along the bottom. One nice feature is the Fill Tool. After clicking on the tool and a region, simply select one color after another to change that region's color over and over again. How handy is that? I'm also in love with the Extrude Tool. Take any two-dimensional object and instantly turn it 3D. I took a block of white text and gave it depth like a comic book logo, simply by dragging the mouse. Though Xara Photo & Graphic Designer has its own proprietary image format (*.xar), you can easily import and export in all the popular image formats, such as JPG, TIF and PNG. If you like, use Xara Photo & Graphic Designer in tandem with other graphics apps like Photoshop in order to get the most out of your experience. Ninety bucks seems like a steal if designing Web sites, improving your company letterhead, or designing the CD cover for your band is the goal. If you're planning to do all of those things, it's an excellent deal. Xara Photo & Graphic Designer is extraordinarily intuitive for the first-time user, but has serious depth for the power user. Note: The trial lasts 7 days by default. However, the trial can be extended to 30 days by registering free. The trial version has access to only a few templates in the Designs Gallery. The full version costs $90.